I filed a complaint with the Justice Center which was formed to collect complaints against OASAS and the NYS Education Department and other organizations that cannot seem to manage complaints. I filed it against the NYS Education Department Office of Professions for basically refusing to investigate ‘the AA thing’ (as the investigator said…’we don’t look into that‘), and that the complete refusal to even acknowledge this complaint had led me to be hospitalized for suicidal ideation multiple times over the past few years, each time after having my complaint ‘officially’ disregarded. Thursday morning at about 5:30 am the Oakland Police called my phone and told me to meet them at my door. About eight cops told me that someone told them I was dangerous to myself, but could not tell me who did. 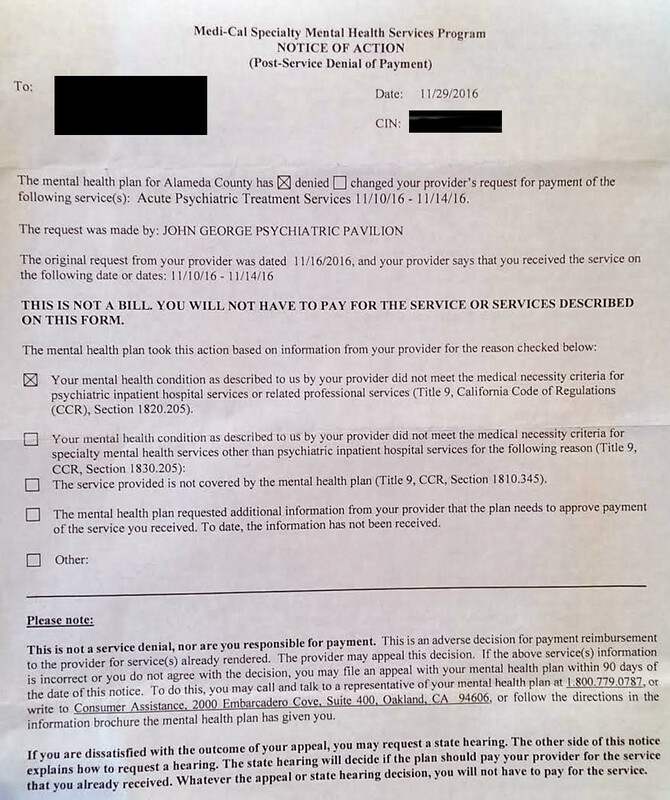 I told them about my complaint and that i was not going to kill myself, that this was just yet another complaint that I have been trying to get someone to acknowledge for about 2.5 years now… but they proceeded to handcuff me, put me into a police car until an ambulance came, then drove me to a psychiatric hospital. I told them I did not agree to go. So, I was there for the last five days, where I was again expected to enroll in a AA treatment center called Cherry Hill in the AHS system. I refused. Today I was discharged, and found my way home with no shoes, keys or wallet. I’ll be waiting for the ~$30k bill that MediCal will probably be paying. 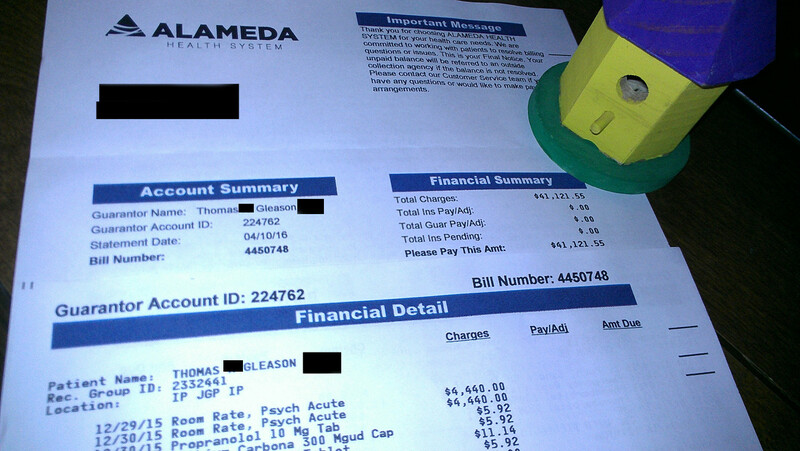 Then I got a letter stating that my condition as described by the hospital did not merit inpatient treatment. So that’s another mystery. It seems that even if the psychiatric doctors no longer think I’m insane, somebody (probably someone in New York State government or from Samaritan Counseling Center, or both) still wants me to be ‘treated’ instead of acknowledging my complaint. I had already gone bankrupt the year before for an about 7 day stay at this John George place and getting this bill for $4440/day (the first two of which I did sleep on that floor).